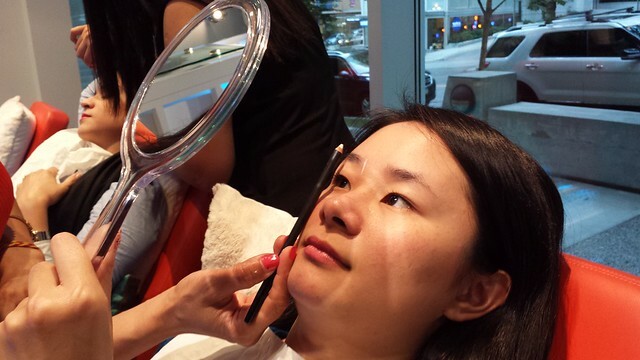 Experience: getting eyebrows threaded for the first time at Blink Brow Bar! 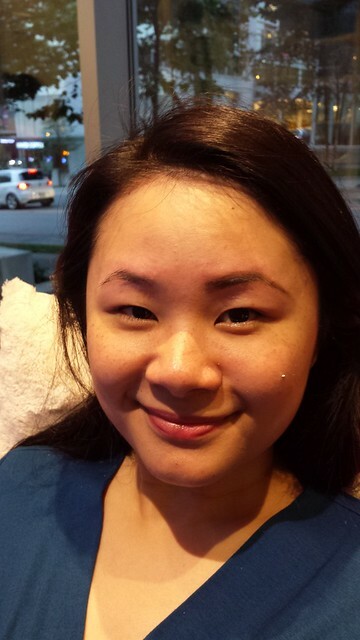 A couple of weeks ago, I had my first ever experience of getting my eyebrows threaded at Blink Brow Bar in Coal Harbour (Vancouver). 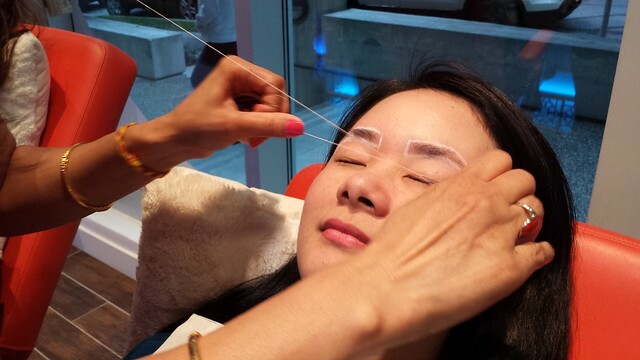 I’ve always been terrified of threading because it looked really painful, and I had this friend tell me once before that threading was more painful than plucking (totally false!). But with some persuasion from J, I decided to take the plunge, and I’m happy I did. 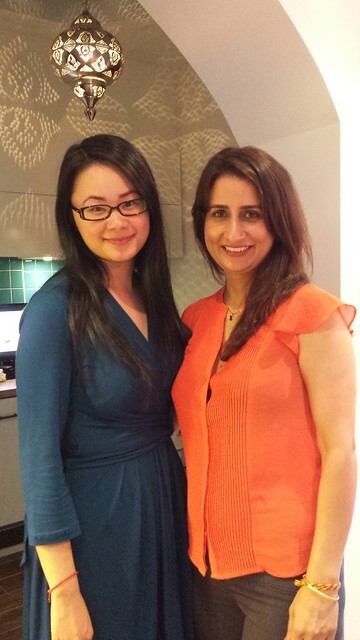 When I arrived at Blink Brow Bar, I was welcomed warmly by Kiran, the owner and brow master extraordinaire. There is a little, comfy sitting area for clients to enjoy a hot cup of homemade chai while waiting for their appointment. The chai was really, really good, probably the best chai I’ve ever had, and I wished I waited longer so I can drink more of that stuff (no joke, I need that recipe). 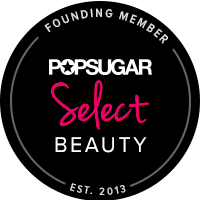 When time came for my appointment, I confessed to Kiran that I’ve never had my brows threaded before so she explained to me the steps in detail, so I would know what I was getting myself into. 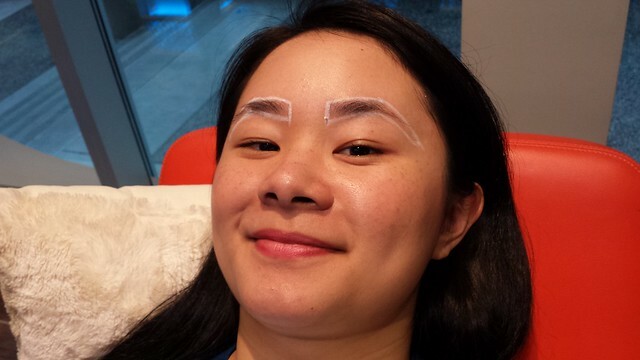 She mapped out the area of how she thinks my brows should look with a white pencil, and then started threading. The sensation was a bit strange, which is not that useful but probably the best way I can describe it, like little pricks. It wasn’t painful for the most part, but I had really thick brows to begin with, so in order to shape them, she had to take out a lot of hair. Kiran was very fast, but very gentle at the same time. 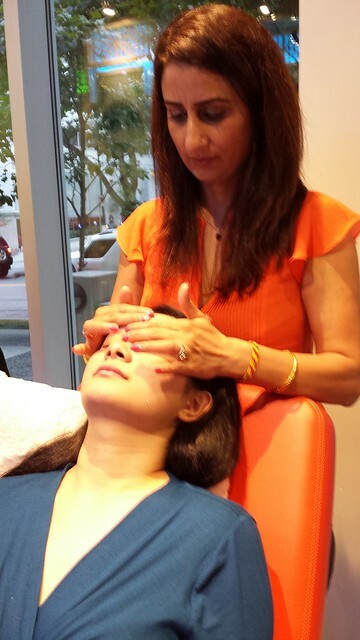 After the threading, I got a relaxing massage around my eyes, temple and forehead area with some sweetly scented rose gel, which helped to calm the redness of the skin. 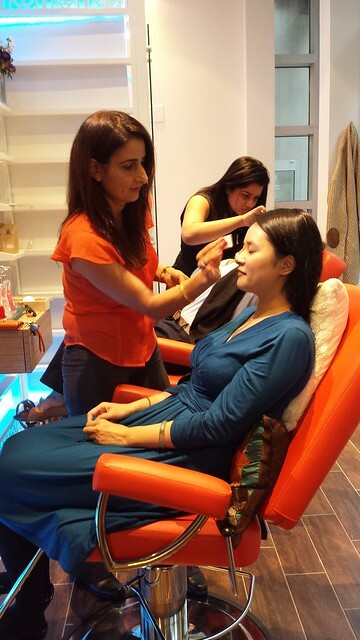 Kiran then applied eyebrow powder and wax to finish off the look (this service is complimentary after every threading). The end result was a much higher arch than what I had before, which was relatively straight, full eyebrows. At first, I was shocked to see myself with such thin eyebrows as I’ve normally just kept my brows looking clean but full. However after a few days, I started to like my new arch. Am I sold on threading? You bet! 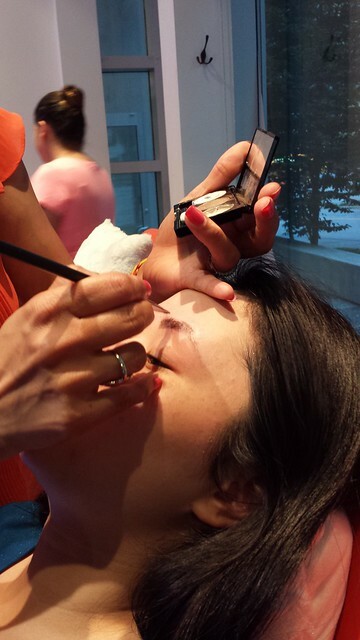 It’s a fast, convenient way to get nice, clean looking brows. 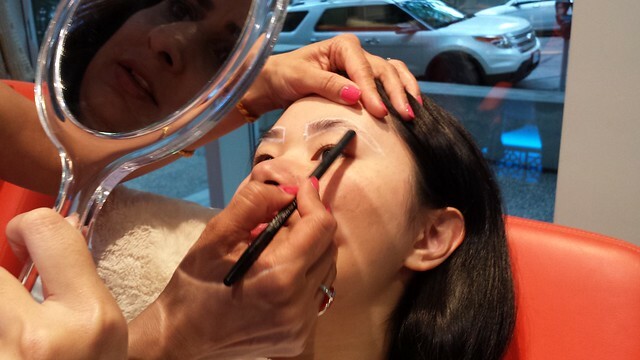 The convenient location of Blink Brow Bar, near the central business district of Downtown Vancouver, means that I can pop by during the day for an impromptu fix-up before a meeting, during my lunch hour, or before dinner or a night out. You can also see J’s recap of her experience. 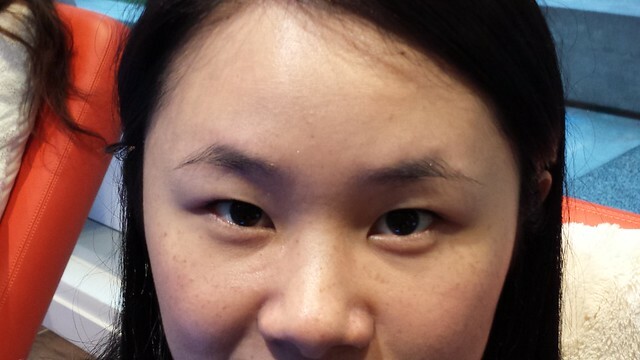 What do you think of my new brows, do you like the thinner, higher arch or the fuller, straighter look? Well, I think I’ve probably said this to you before, but I prefer your new brows 🙂 I think your brows before had nice thickness, but they weren’t very cleanly defined, so if you decide you don’t like them thinner, maybe you can just get them to shape it somehow without thinning them overall? Thanks J! I’ve been slowly growing them out and haven’t shaped them yet, so I will do that to make them more defined. They’re back to being bushy and straight now, haha. I only do threading!!! I could never go back to waxing. Love it. This place sounds awesome too! After reading J’s blogs about it, I have been so excited to try out Blink Bar. Now reading your experience, I’m that much more sure that I’ve got to try it out soon! I think your brows look lovely! I’ve never tried threading before either!